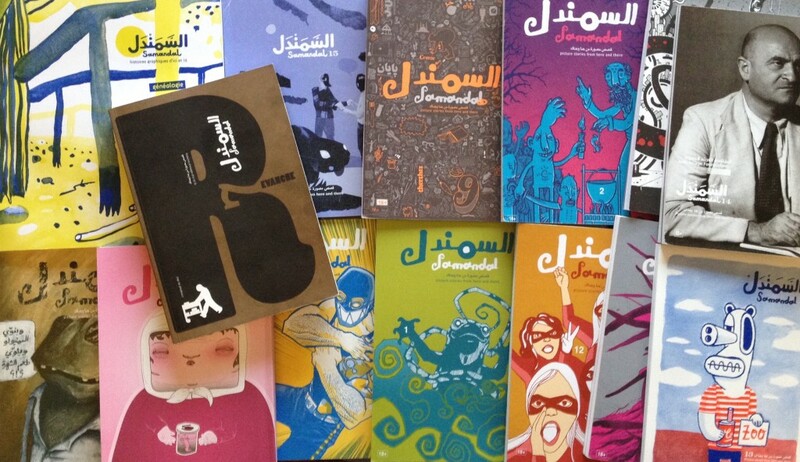 Without a doubt, the current world hot spot for underground and experimental comics is the Middle East and North Africa–a fact that might surprise many Americans. From Egypt’s Tok Tok to Lebanon’s Samandal to Nadia Khiari’s radical cartoon cat Willis from Tunis, creators across the region are reinventing the format, circumventing government censorship and publishing taboos through the use of crowdfunding and social media. Unfortunately, many of these works are still difficult to find in mainstream bookstores in their home countries, let alone the United States. Recently in the Los Angeles Review of Books, Arab comics expert Jonathan Guyer reviewed a book that brings a small selection of the bounty stateside: Muqtatafat: A Comics Anthology Featuring Artists from the Middle East Region, edited by A. David Lewis, Anna Mudd, and Paul Beran. By necessity, Guyer’s lengthy review is also an overview of Arab comics in its own right, touching on many of the challenges faced by creators in the region. Political cartoonists have long irked those in power and this struggle predates the uprisings of 2011. The Palestinian dissenter Naji Al-Ali was killed in London in 1987, while Algerians Brahim Guerroui and Mohamed Dorbane were assassinated in 1995 and 1996, respectively. In 2014, unknown gunmen killed the young Libyan activists Tawfik Bensaud and Sami Elkwafi as they were working on a manga project (though their chilling murders more likely relate to their youth activism). For artists working in the West, tensions have of course heightened since the 2015 attacks on the French comic weekly Charlie Hebdo. Guyer also cites the $60,000 government fines levied against three Samandal editors for insulting Catholicism and the arrests in Egypt of cartoonist Islam Gawish and author Ahmed Naji, whose experimental novel The Use of Life includes “comic interludes” by Ayman al-Zurqany. Gawish was released without charge after being questioned last year for allegedly “operating a Facebook page without a license,” but Naji is just a few months into a two-year prison sentence for “violating public modesty” with an excerpt from his novel that was republished in Akhbar al-Adab newspaper. Bookstores in Algiers, Beirut, or Cairo are better [than in Gulf states], but it is still rare to see more than a full shelf of alternative comics at even the finest bookseller — this in spite of the breadth of new productions. Even at Cairo’s sprawling book fair, it was impossible to find any of the rabble-rousing comics from Lebanon, Morocco, or Tunisia, let alone Egyptian zines like Tok Tok. The widest selection of Arab comics, cartoons, and strips I have ever seen in one place was, surprisingly, at the gift shop of the Institut du Monde Arabe in Paris. Check out Guyer’s full review of Muqtatafat here. The anthology is available from Ninth Art Press.